Yesterday was an eventful day. We drove on the highest mountain road in Norway, managed to have a small altercation with another vehicle breaking our wing mirror, and I was interviewed for Norwegian radio, live! The RV55 from Lom starts with lush valley meadows and the road slowly ascends through the valley before reaching the summit at 1,434 metres, making the road northern Europe’s highest mountain pass. According to Google maps, the route we covered is 138 km long and should take 2 hours and 52 minutes. It took us 24 hours, including an overnight stop, in a parking area next to a fast flowing deep river, many other viewpoint stops and a very slow descent on one of Norway’s steepest roads. The road was used for trading and was an important transport link to the coast of Norway. Using this mountain road was not without its perils in days gone by as bandits robbed travellers and merchants. The weather is so severe on the road in winter and the snow so deep that it is impossible to keep the road open. Snow poles mark the edge of the road at close intervals and there was still very deep snow when we were there at the end of May. Parked at one of the many viewpoints on the RV55 mountain road in Norway. As we reached the summit of the road the Norwegian ski team were training in the still significant amount of snow left, although at its peak the snow is 10 metres deep. 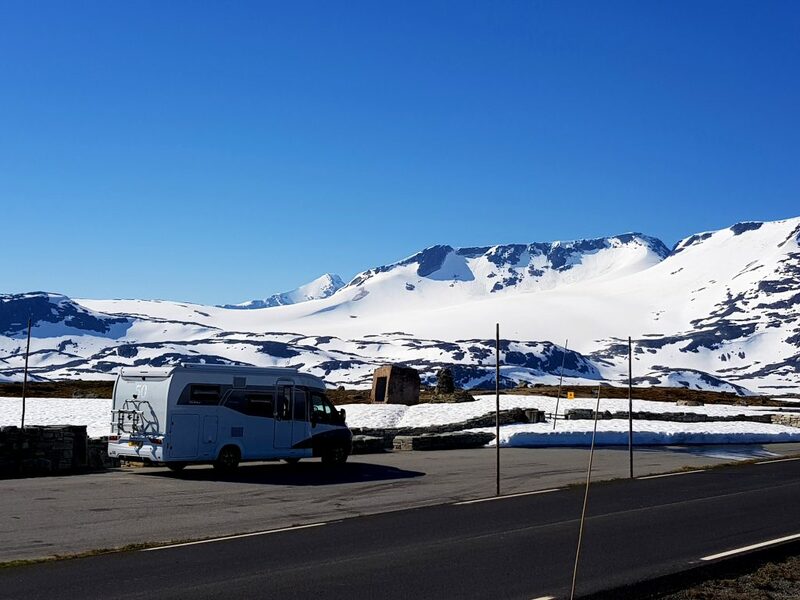 We parked our motorhome at one of the many viewpoints and stood awestruck at the magnificent snow capped mountains and wilderness on view before us, stretching as far as the eye can see. We stopped at one point to see a memorial for six men who lost their lives in the 19th century when they went looking for food and perished in the extreme cold. We stopped to take photographs and I got my drone out to take some aerial video. It was shortly after this that we damaged a wing mirror when a fast approaching van failed to slow down when we met and cracked the plastic casing of the passenger wing mirror. Luckily the glass was unaffected but I wished that I had listened to Anne’s advice and bought some mirror guards to help prevent damage like this. After a very steep descent down a road with too many hairpin bends to count and many curses with “surely this road must end soon” we eventually reached Skjolden, a pretty town at the end of Lustrafjorden, where we stopped for lunch. The final part of this road is a dramatic drive along the fjord, where we had to stop for 20 minutes when the tunnel was closed due to roadworks. When the tunnel re-opened there were only about 20 cars in the queue, which shows how quiet the road was. The roads we have driven along in Norway just keep getting more dramatic and the RV55 was much longer and steeper than Trollstiggen (blog post here) or Dalsnibba (blog post here) that we had driven along recently. We eventually reached the town of Sogndalsfjora and found the Kjørnes campsite, which turned out to be a very good choice. With immaculate showers and great views we decided to spend two nights here. Eating waffles, in our motorhome, with the owner of Kjørnes Camping whilst being interviewed for Norwegian radio. We were relaxing in the evening sunshine, without beer because it’s too expensive to buy, when a Norwegian radio car pulled up and a friendly young lady asked us if she could interview us for Norwegian local radio. Never to shy away from such things, and telling her that I had several times been interviewed by the BBC about travel and tourism, she returned the next morning for the interview. The lovely campsite owners were also interviewed and we were all crammed into our motorhome whilst being live on the radio. An interesting experience! We spent 2 nights at the excellent Kjørnes Camping. Map of our journey along the RV55 from Lom to Sogndals. I put together a short video using a drone and motorhome dashcam.